So, toasted coconut is about to rock your world. Oh and coconut caramel. 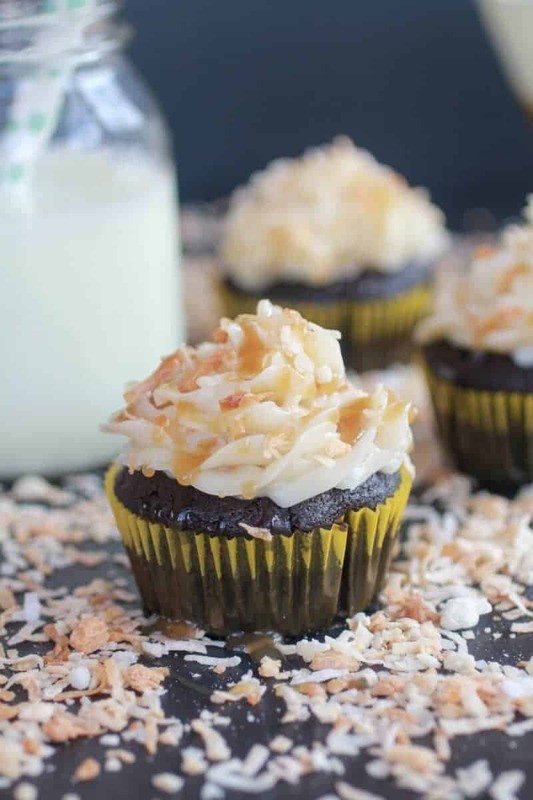 Before I made these cupcakes I had never had toasted coconut! I now know that was just plain stupid. I mean like whoa. Toasted coconut is awesome! This whole no coconut thing? Yeah, you can totally blame this on my mom, who is a chocoholic and would choose the dark stuff over anything white anytime, any day, any meal. But that is only because she does not know what she is missing…until now. Case in point, these cupcakes. I totally made these on a whim the other day simply because I asked Asher what we should make and her eye’s lit up and she said CUPCAKES! Of course, I should have known she would say cupcakes. I mean we are talking about Asher here, remember she wants cookies for breakfast. Trust me if I would let her, she would eat these cupcakes for breakfast too. Ok, so here is the rundown. Really did I just say the word rundown? Yeah, I did. Please understand that I have a four-year old screaming in my year “I am hungry, I am hungry, hungry, hungry, Tiegy I want dinner”, I am surrounded by little princess figurines (whose rubber clothes are the hardest thing to slip on) and I have 3 hungry boys waiting to be fed their chicken. Seriously, my parents owe me. Wait, that’s an exaggeration. I am being a little dramatic. Well, not about all the crying, feeding and playing. That’s all very accurate. But really my parents don’t owe me I am happy to help out and I love taking care of Asher. We do pretty much everything together. As Asher say’s “Tiegy, we’re best sisters, always!”. Is it weird that my four-year little sister is seriously my best buddy? I know, it is obvious. I need a life. Anyway, these cupcakes are like WOW! Even my non-coconut lover of a dad absolutely loved these. I actually could not believe how awesome they are. They’re moist, chocolaty and coconuty. 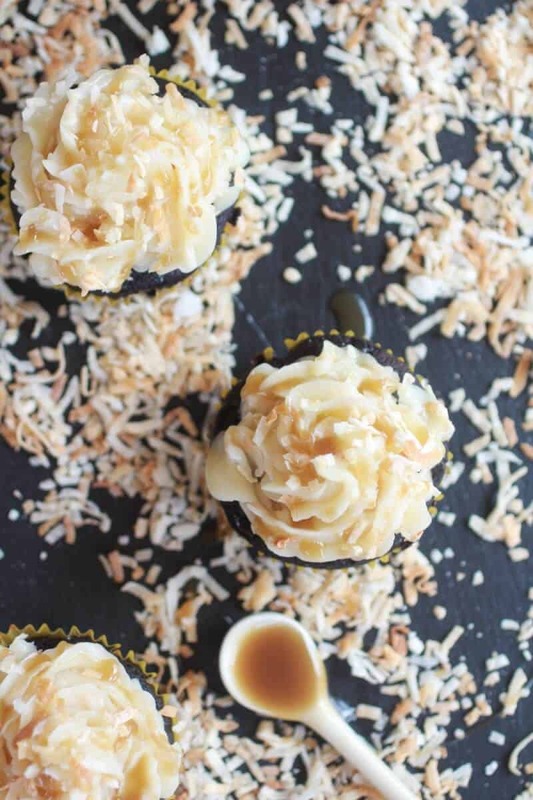 The coconut caramel sauce is maybe one of the most genius creations. The flavor is just so good. 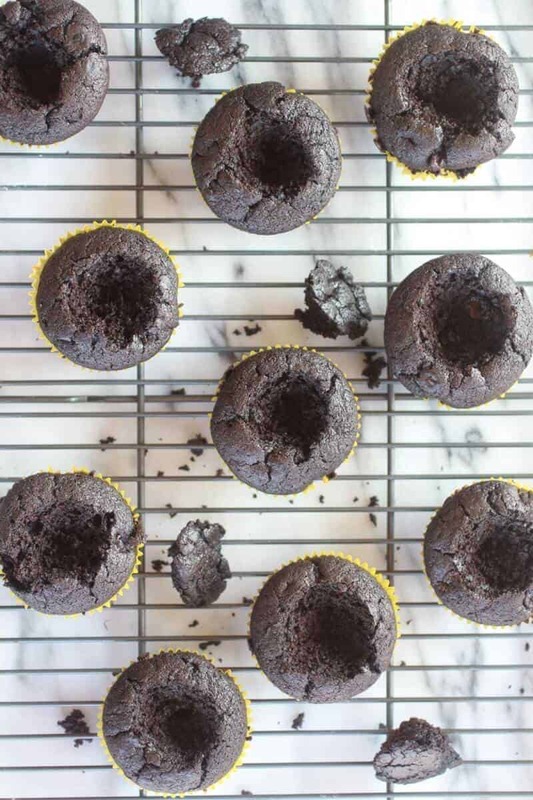 It sinks into the dark chocolate cupcake and just flavors the whole thing. It. Is. So. Good. Then there’s the frosting. Oh the frosting. Guys it’s coconut, butter and toasted coconut. 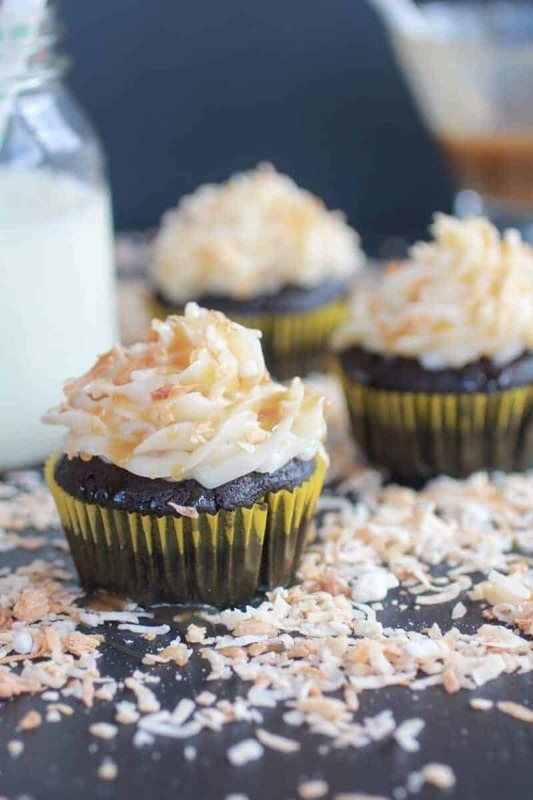 It’s low on powdered sugar but the toasted coconut makes up for it with its own natural deliciousness and then gives it that extra toasted crunch. All that along with the buttery smoothness, mmm… it is just perfect. Oh, and don’t skip the garnishes guys. 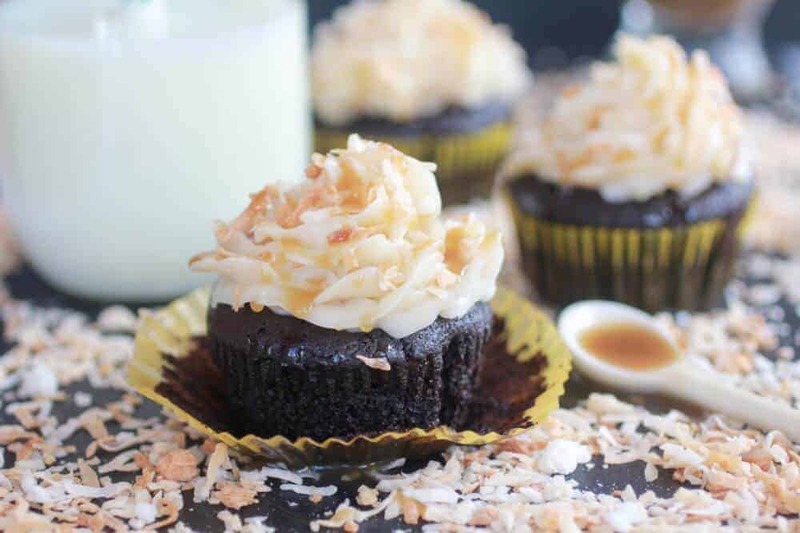 The crunchy toasted coconut and the extra drizzle of coconut caramel sauce just puts this cupcake way over the top. Make them for Easter, make them tomorrow, geez – just get up and make them now. No, really I would! 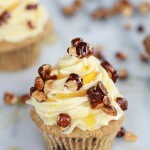 These delicious cupcakes are packed full of flavor! 1/4 cup strong brewed coffee cooled to room temp. Start by making the Coconut Caramel Sauce. Whisk together the coconut milk, vanilla, and salt in a small bowl. Set aside. Combine the brown sugar and water in a small saucepan over medium-high heat. Bring the mixture to a boil. Once it begins to boil watch closely and whisk until the mixture starts to smell like caramel and turn a golden color, and then to a light brown. This will take about 5-6 minutes. When you see that it has started to turn brown, slowly pour in the coconut milk mixture, whisking constantly and quickly. The sugar will harden around the whisk, don’t worry, it will melt. Just keep whisking! Continue to heat over medium-high until mixture has thickened and is a light caramel color, about 5 minutes more (dont let it get too thick, it will thicken as it sits). Remove from the heat and set aside. In the bowl of a stand mixer or large mixing bowl combine the flour, cocoa powder, baking soda, salt and suger. Whisk to combine. In a small bowl add the coconut milk, egg, canola oil and vanilla extract. Stir lightly and then add to the flour mixture. Beat until the ingredients are well combined and then add the warm coffee. Beat well, until the mixture is very smooth. Fold in chocolate chips. Line a muffin tin with liners and using a 1/4 cup measure, add batter to each cup. Bake for 15-18 minutes. Let cool completely before filling and frosting. While the cupcakes bake make the frosting. Cream the butter in the bowl of an electric mixture until completely smooth and creamy. With the mixer on low speed, add in powdered sugar slowly. Gradually increase mixer speed and add vanilla. Then beat for 2-3 minutes, scraping down sides and bottom of the bowl. Beat in the coconut milk. Continue to whip for another 4-5 minutes, continuously scrapping. If frosting is too thick, add coconut milk 1 teaspoon at a time until desired consistency is reached. If it’s too thin, add powdered sugar gradually until it thickens (I like to keep mine very thin and less sugary). 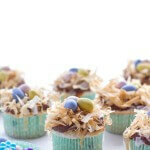 Fold in shredded coconut and toasted coconut and mix until just combined. 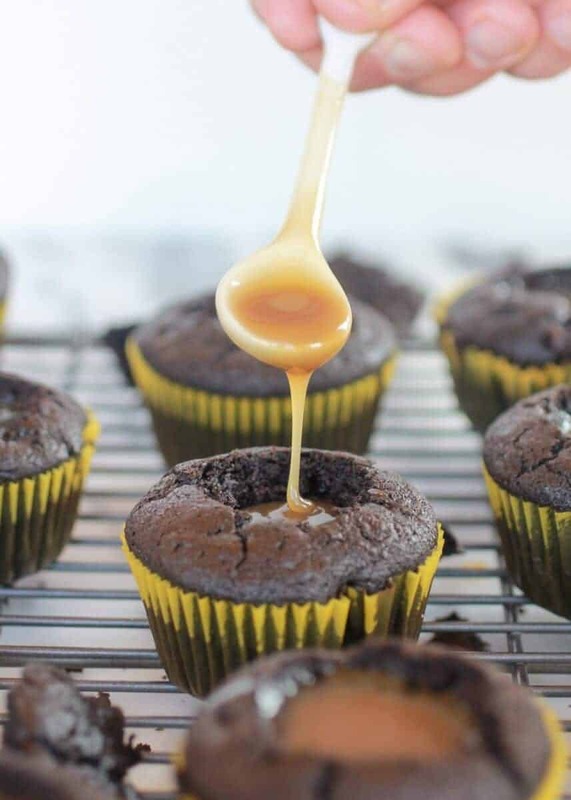 To assemble the cupcakes: Use a small paring knife to cut a cone-shaped piece from the center of each cupcake. Fill the hole with coconut caramel sauce, then replace the top portion of the cone (you'll need to slice off the tip). Transfer the Vanilla Coconut Frosting to a pastry bag fitted with a tip. Pipe frosting into a swirl on each cupcake (you can also just spread the frosting on with a knife). 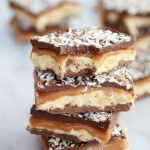 Sprinkle with toasted coconut and drizzle with additional coconut caramel sauce over the top, if desired. 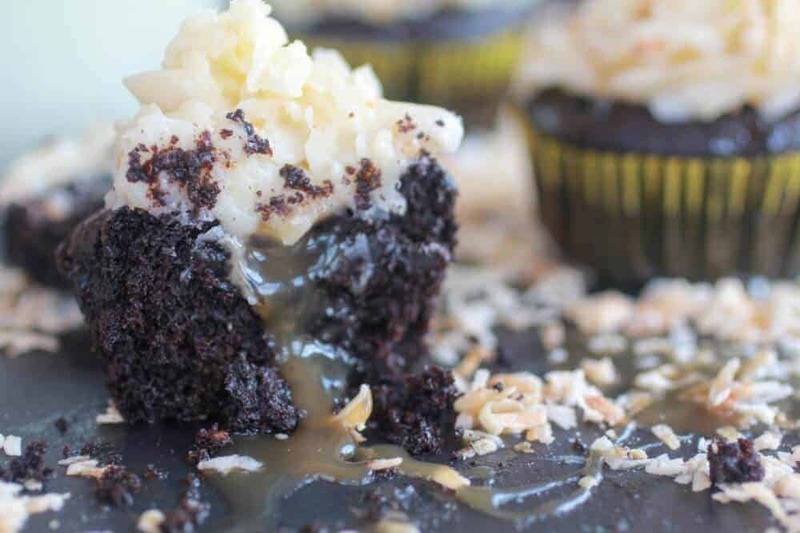 I mean come on, look at that coconut caramel just oozing out! I am your newest fan. These look amazing Tieghan! I clicked on your name in the comment section of Bevs site. Man am I glad I did! YA! i am so excited to have a new fan! So happy you clicked on my name! PS dont you just love Bev! Man that girl is to funny! Thank you hope you make these! These look amazing! 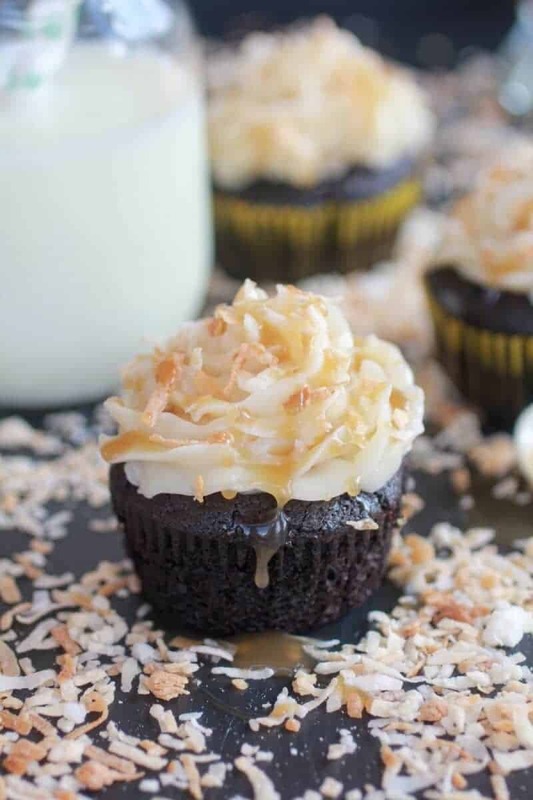 anything with caramel, chocolate and coconut and you can count me in! Yum! Hi! I hopped over from Kitchen Fun with my 3 Sons. All the flavors of my favorite girl scout cookies,samoas! These could be dangerous! Thank you for sharing they look to die for! Thanks so much for stopping by! An they are totally dangerous! Gorgeous! I’ll take a dozen, please?!! Thank you Lauren!! They are only an hour and half drive away!! LOL Have a great Easter weekend! What was I thinking reading this when I’m hungry?! Those look killer! Thanks so much Carrian!! I hope you are doing some relaxing this weekend!! Thanks so much for reading! These look wonderful. Found you today via Rattlebridge. Every single layer. I want. The chocolate, the little holes you dug out, the caramel sauce!! the frosting…yes. Pinning! HA!! Thanks so much for pinning Averie!! Sorry, I should have said this in the recipe! I will got and fix it, but the canned stuff. Hope you love these! I am not sure I have ever toasted coconut before either. Now I have to give it a try! These look delicious. Trust me! Try it, it’s insane! Thank you and thanks for pinning! Loving everything coconut! Hope you love these! These are amazing! I love how it looks when the caramel drips over the top! Tank you, that caramel is maybe the best thing ever! You and me both! My coconut obsession is getting out of control! Oh. My. Goodness! The caramel inside sounds soooo yummy! Your photography is amazing. I love your recipes. Thanks for sharing at Two Cup Tuesday at Pint Sized Baker. I hope you join me on Monday night. Thank you so much Karyn! That is so nice of you to say! Photography, is something I struggle with daily! I just made a vegan variation of these for a dinner party… they were soooo delicious and everyone was pretty impressed! Thanks for the recipe! I am so glad you liked these!!! I bet they were pretty easy to make vegan and tasted just as good!! Thanks for letting me know you loved them! Cupcakes for breakfast are totally cool! Thanks so much for reading! Oh, these sound terrific! Have to try them soon! Again… wow! Loving your recipes and your blog. Glad I stopped by. Thank you and I am so glad you stopped by! Oh my goodness, these look oh so fabulous!!!!!!!!!!!!! Wow! Thanks for sharing. Yum!! These look so yummy. I could eat them from the screen…if only. Thank you! Darn screen, it’s always getting in the way! I just made these for my friend’s birthday. THEY. WERE. SO. GOOD. 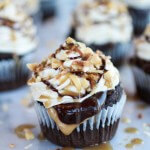 Maybe the best cupcake recipe ever. The coconut milk in the icing AND the caramel was amazing. Will definitely save this to make again!!! Thanks so much for sharing! I’m excited to try more of your recipes. SO happy you love the cupcakes! THANKS!! For the coconut milk, did you use canned coconut milk? I’m excited to make these for a bridal shower this weekend! P.S I made your coconut pumpkin spice latte and it was FANTASTIC! caramel, so good! I can’t wait to try these! YAY Hope you love them Kim! 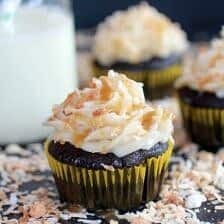 Just made this cupcake recipe but substituted plain kefir for the milk and applesauce for the canola oil. Delicious! I am so happy you liked it! Thank you Taylor! I made these last year and they were amazing! Any changes to make them into a layer cake? Would love to make these as a cake for Easter! I’m going to try these this weekend. A little confused on the frosting, do I use 2 sticks of butter or 2 cups of butter? Since one stick is actually half a cup of butter, I want to make sure I add the correct amount. Thanks! This is not a good recipe…some of the ingredients is off.